My wife doesn’t mind me caching. Possibly because I get out from under her feet but equally as likely because it’s an opportunity for her to enjoy the countryside and come with me for a walk. We recently enjoyed a break in the Lake District and whilst we both enjoyed the amazing scenery I took the chance to pick up a variety of caches along the way before we both fell exhausted into the nearest pub for a well earned drink. Life was good. On the return to normality however, with its grocery shopping instead of long lazy fireside lunches and spending money on wallpaper instead of new walking boots geocaching has to, reluctantly, take a back seat. Or does it? A day or so after our return to East Anglia, we visited a new town, within which was a particular shop that we needed to visit. Normally a trip such as this to ‘virgin territory’ would leave me scrabbling for my GPS and the Geocaching map but not this time. I was under strict instructions that this was to be a functional visit only and there was to be no caching. I had been told. I wasn’t going to be beaten. I could always swing by the local supermarket on the pretence of getting a sandwich and pick up an ‘off your trolley’ cache, perhaps I could park near the train station and nab a sidetracked. I had options. During the past week I had heard that the iOS App, ‘Next Cache’ had been re-added to the App Store. This is an App that will happily load your PQ and allows you to set a distance from the nearest cache which it will alert you to. 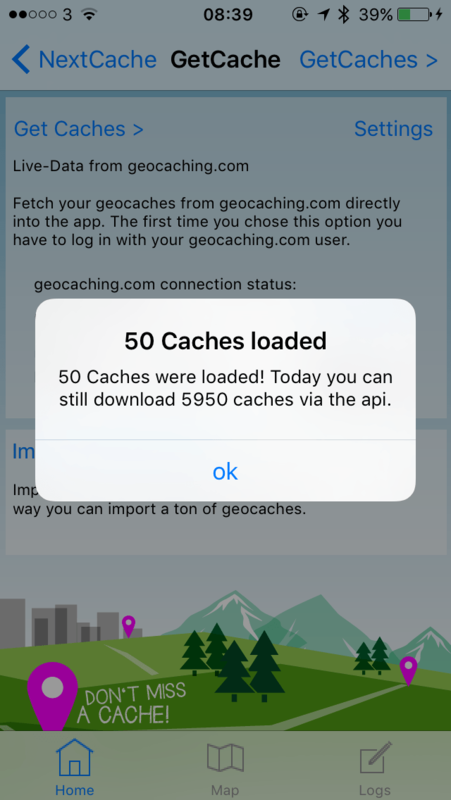 It will also allow you to load the nearest caches directly from the Geocaching website using the API and store them ready for use. When you are walking or driving and happen upon one of the caches, it will bring up an alert and give you a gentle reminder that you are about to travel past. Alerts you to the cache. I had installed the App in case it happened to be deleted again and was playing with the settings, as well as loading up a PQ that covered the no-caching area I was about to visit when I had a brainwave. On my wrist I sport a Garmin Vivosmart. A fitness band that counts my steps, records when I run and monitors my sleep patterns, amongst other things. It also alerts me, via a gentle vibration, to any notifications that my phone decides to send, calls, emails and texts, and you can read the information right there on your wrist before deciding to reach for your phone. It doesn’t have any GPS functionality but by allowing next cache to send me notifications it meant when I was within striking distance of a cache, it would vibrate on my wrist and tell me exactly how far the cache was, what it was called and other snippets of info about it. Using this, I could covertly keep an eye on caches around me, right under the nose of my family and wander off to find them with arousing suspicion. I have the Geocaching bug pretty bad. 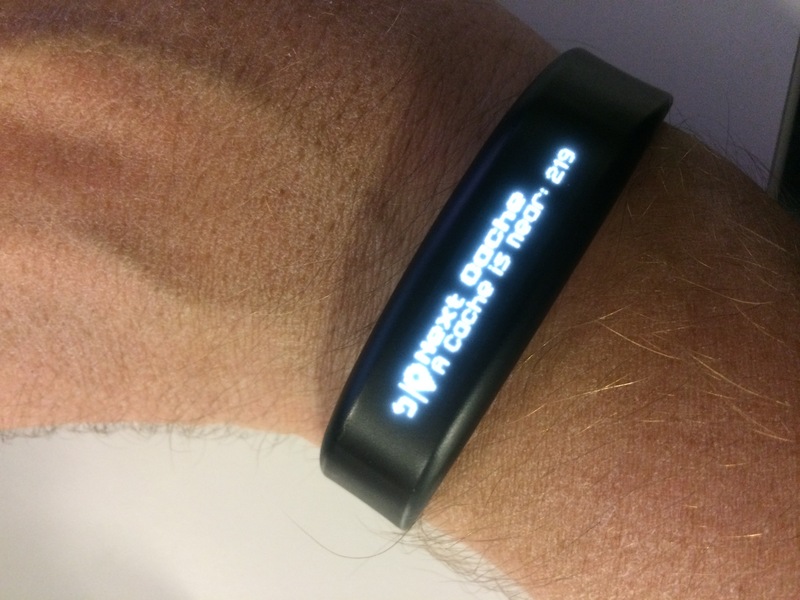 Be the first to comment on "Next Cache and Garmin Vivosmart"